Roses bloom in cycles. The weeks between the time you cut the rose and the time it blooms again constitutes one bloom cycle. 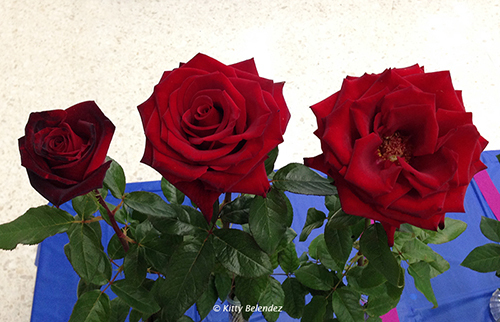 Generally roses bloom in 6 to 8 week cycles, and a few require even less time. If you want roses for a particular rose show, you will want to look at a calendar, count back about 7 to 8 weeks, and cut your rose bushes on a date that falls 7 to 8 weeks before that rose show date. Some of your roses may come in late and some too early, but most of them should bloom on time, all things being equal. This is what rose exhibitors do to maximize the blooms they have for the shows. The first rose bloom cycle (which begins with your winter pruning), is very difficult to time because it can be affected by frost, which will slow down the growth of your rose bushes, and hot spells which will speed it up. The subsequent cycles are much more predictable. Watch your roses, keep records, see which roses take 5 weeks to bloom, 6 weeks and so on. 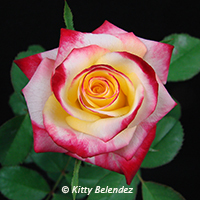 See how much longer it takes for a floribunda to produce a spray instead of a single bloom. Knowledge of the stages that roses go through during each bloom cycle will help you understand what they need to be fed and what extra work might be desirable at any particular time. Good exhibition roses really do need to be fed at least every other week. They also require somewhat constant attention if you want them to be their very best. You are probably aware that there is a time when most of the roses in your garden are in full bloom. When you deadhead these roses, a new cycle begins. This is the time to feed them organic fertilizer which will "kick in" about 6 to 8 weeks later. What you are really doing is feeding the soil and its organisms at this point. The next stage is when the new foliage is about 2" long. This is the time to feed your roses a fertilizer that is high in nitrogen, like 10-10-10, to promote the growth of the stems and foliage. At this stage you can "thumb prune" the rose bush. Thumb pruning allows you to identify the stems that seem to have the best "rose show potential" and get rid of stems that do not. You will want to look at your new growth. If the rose stem seems to be growing straight, upright and in a position where it will not be obstructed as it grows, keep it. If it seems to be growing into the center of the plant, facing downward, or in danger of crossing another stem, simply break it off with your thumb. By cutting down on the number of stems each rose bush will grow, you force the plant to put its energy into only the very best stems and blooms. The third stage of the rose bloom cycle is when the stem begins to set buds. At this point you will want to cut back on the nitrogen and boost the phosphorus to increase the size of the blooms. A fertilizer, like Magnum Gro, that is 8-10-8 is appropriate at this point. This is also the time to start "disbudding" your roses. This means you need to look at each stem and decide if you want it to grow a single bloom or a spray. For a single bloom, you leave the large central bud and remove the smaller sidebuds on the stem. For sprays, you remove the larger terminal, or center, bud and leave the sidebuds. This should be done very carefully, as it is easy to accidently remove all the buds! By disbudding at this point, you minimize the black scars that mar the stem of your exhibition rose. You should continue to disbud the roses through the rest of the bloom cycle as needed. Keep in mind that sprays of only 3 or less, seldom win. When you disbud to produce sprays, you may find a week or so later that the sidebuds you left have now grown sidebuds. In this case, repeat the process of removing the center bud and leaving the new sidebuds again. That's how good exhibitors get those really big sprays. The fourth cycle is when the roses are almost ready to bloom. The stems are long. The buds are large, but the sepals have not yet cracked. This is about 2 weeks before the roses actually start to bloom. At this point I suggest that you back off the nitrogen altogether, certainly feeding nothing that is over 5 in nitrogen (the first number on the bag). Feeding your roses too much nitrogen at this point can cause some of the centers of your roses to become "confused" and unattractive. I usually use 0-50-30 at half the recommended strength at this point. This is also the time I will add an iron supplement to darken up the rose foliage. The final stage is the last 2 weeks when the roses bloom. During this stage you do not need to feed your roses, but you will want to cut out any undesirable growth that may be obstructing the path of a rose that looks really promising. You will also want to be careful to avoid getting water on the rose blooms at this point. Standing water will often leave unattractive spots on the petals. In Southern California our roses have a very long growing season and several bloom cycles. During the 1st and 2nd cycle (from about March through June) you can follow the above schedule. During the next cycle (from July through August), you can do minimal work. Keep the roses watered and feed them something slow acting like an organic or time released fertilizer to keep them going. During the cycle that begins at about Labor Day and continues until the middle or end of October you will want to "kick into show mode" again. After the last feeding in October, you can relax and let your roses "do their thing" until you prune them again for winter. We also have many microclimates here. This can also affect your particular rose bloom cycle. Perhaps appropriate feeding times for one microclimate, will not apply to your garden. Understanding the cycles and stages your roses are going through will help you tailor your rose care program to your own roses. © Copyright Lynn Snetsinger. All rights reserved.